After a lengthy battle, a grassland bird called the lesser prairie chicken has been listed as threatened under the Endangered Species Act, the Obama administration announced Thursday. Pushed out of its historic habitat by activities like oil and gas drilling, ranching and construction of power lines and wind turbines, the species' population has fallen to nearly 50 percent lower than 2012 population estimates. 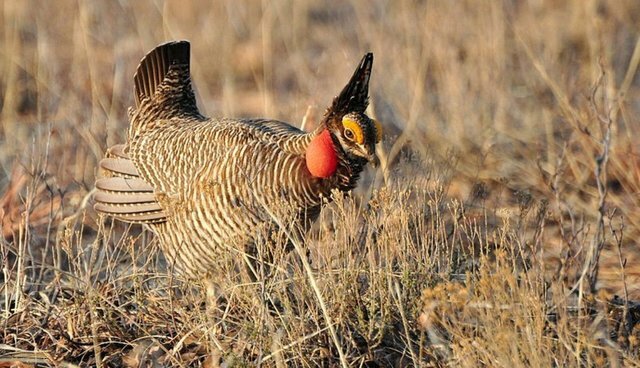 "The lesser prairie-chicken is in dire straits," Dan Ashe, director of the US. Fish and Wildlife Service, told AP. "The bird is in decline and has been in decline for more than a decade." The five states affected by the listing -- Texas, Oklahoma, Kansas, Colorado and New Mexico -- have adopted a conservation plan to bring the bird's population from 18,000 to 67,000, though the governors from each state have opposed the listing. Conservationists have been fighting for over two years for the listing, which has been opposed by oil and gas proponents. The new measures will allow private landowners to manage conservation, in a sort of trade-off for continued energy development. While conservation groups welcomed the new protections, they say that it still allows for oil and gas drilling in exchange for voluntary conservation plans that can't be easily enforced.